Next weekend I will be honored to be in residency at the University of Philosophical Research in Los Angeles (http://www.uprs.edu). This historical center grows from the tradition of great philosophers of history who perceived an intelligible world with progressive, dynamic and emergent properties of consciousness. The univeristy’s tradition is shaped by such seminal thinkers as Pythagoras, Plato, Socrates, Manly P. Hall, Sri Aurobindo, and Lao Tzu. What an amazing honor and awesome responsibility! 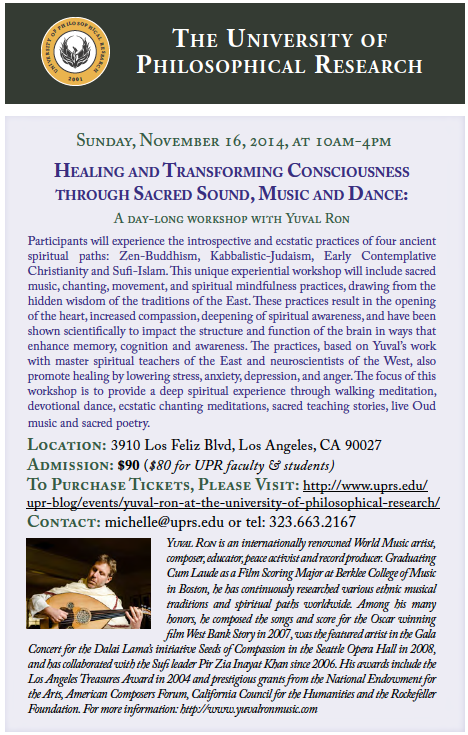 Firstly, on November 15 2014 I will be presenting an event dedicated to my new book Divine Attunement: Music as a Path to Wisdom, and later that weekend on Sunday November 16 2014 I will lead a full day seminar were participants will experience the introspective and ecstatic practices of four ancient spiritual paths: Zen-Buddhism, Kabbalistic-Judaism, Early Contemplative Christianity and Sufi-Islam. This unique experiential workshop will include sacred music, chanting, movement, and spiritual mindfulness practices, drawing from the hidden wisdom of the traditions of the East. These practices result in the opening of the heart, increased compassion, deepening of spiritual awareness, and have been shown scientifically to impact the structure and function of the brain in ways that enhance memory, cognition and awareness. The practices, based on my work with master spiritual teachers of the East and neuroscientists of the West, also promote healing by lowering stress, anxiety, depression, and anger. The focus of this workshop is to provide a deep spiritual experience through walking meditation, devotional dance, ecstatic chanting meditations, sacred teaching stories, live Oud music and sacred poetry.